You should remove Websearch.simplesearches.info if it has infected your system because its presence might endanger your virtual security. While it pretends to be a legitimate search tool, as a matter of fact, it is a browser hijacker that alters your home page and search engine, and it does not even ask for your permission. But this is just the tip of the iceberg. Websearch.simplesearches.info affects Mozilla Firefox, Google Chrome, and Internet Explorer as well, so if you use any of the major browsers, you will risk possible malware infections every time you surf the web. If you want to know more about Websearch.simplesearches.info and how you can delete it from your system, please read our full report. Websearch.simplesearches.info belongs to the constantly growing Websearch browser hijacker family and is identical to Websearch.searchtotal.info and Websearch.simple2search.info. Practically, all members of this family are clones with a different name. They all come in free software packages that are bundled by third-party installers. This distribution method, however, has a potential threat for users. Namely, Websearch.simplesearches.info might enter your system with a number of malware infections. There is no doubt that apart from removing Websearch.simplesearches.info, you should also delete all other threats if you want to keep your system safe. You also need to know that Websearch.simplesearches.info is a totally unnecessary tool. Although, it is supposed to be a search provider, what it really provides is the redirection of your queries to a major search engine, such as Google. However, do not be surprised if you find potentially harmful sponsored links among the search results. Keep in mind that third-party links might redirect you to malicious websites where you can get infected with malware. 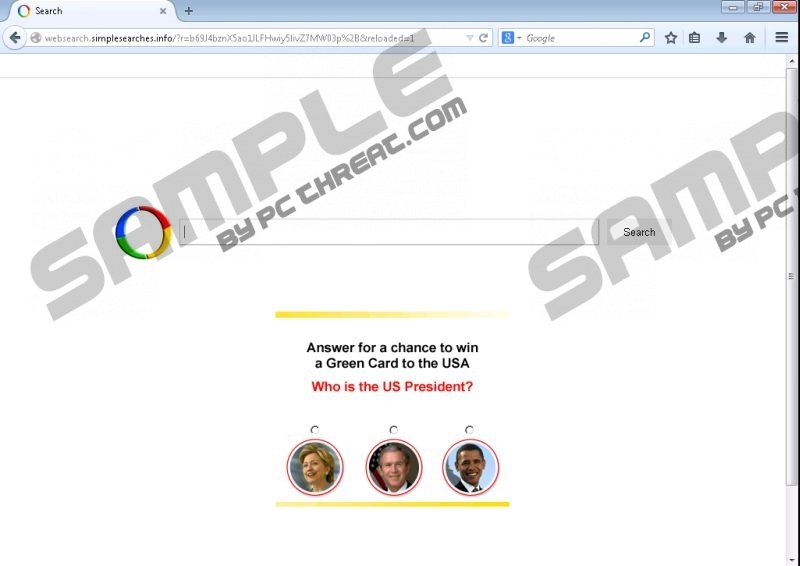 If you do not want to be exposed to such a threat, we recommend removing Websearch.simplesearches.info from your PC, which will also eliminate the possibility of clicking on a third-party ad this hijacker displays on its main page. Keeping Websearch.simplesearches.info on your computer might also lead to identity theft since this hijacker can collect personally identifiable data about you beside other bits of information, including your IP address, your searches, and the websites you visit. If you want to avoid this, you should remove Websearch.simplesearches.info right now. Schemers have sophisticated methods to access and abuse the data recorded by hijackers. If you want to avoid becoming a victim of an online scam, you have no other choice but to delete Websearch.simplesearches.info. Unfortunately, removing Websearch.simplesearches.info is not a single click away; it requires a little more than that. Once you reset your browsers following our instructions below, you also need to run a trustworthy scanner to detect any other potential threats or leftover components. You can also choose to automatically remove all infections if you implement a reliable antispyware tool, which will also safeguard your system from malicious attacks in the future. Access the Tools menu and go to Internet Options. Press Alt+H simultaneously and select Troubleshooting Information. Press Refresh Firefox and press Refresh Firefox again in the confirmation window. Tap Alt+F simultaneously and go to Settings. At the bottom of the page click Reset settings. In the pop-up click Reset. Quick & tested solution for websearch.simplesearches.info removal.